Work hard, earn points – that was the wisdom I learned from my parents in my school days. Only much later did I realize that putting all of my effort into something was not sufficient for “success”: circumstances beyond my control govern whether I become a Hollywood star or a Nobel Laureate. 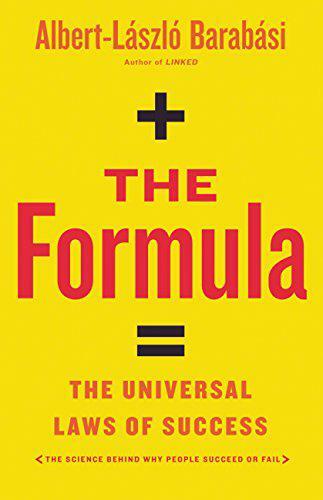 This gut feeling of mine is now explicitly supported by mathematical “truth,” according to László Barabási’s entertaining and edifying new book The Formula: The Universal Laws of Success. The punchline of this thoughtful analysis of human endeavor is that while we can improve our performance within limits, success is controlled by hidden and complex social dynamics. Barabási, a guru of network science, put the relationship between performance and success under the microscope by challenging his research group at Northeastern University to discover the quantitative laws governing this seemingly straightforward connection. Together, they examined massive databases of research papers to reconstruct the careers of successful scientists. They appraised patterns of all book sales in the United States to predict their commercial success. They gathered information about gallery and museum exhibits to rebuild the career of contemporary artists. They scoured huge datasets in sports and business. With all that data and analysis in hand, they developed a specialized search engine to predict, for instance, who among hundreds of promising art school graduates would have their pieces displayed in the Met. As the author of the bestselling book Link, Barabási is acutely aware that scientific ideas gain power when explained in accessible language. He earned my kudos on this front by the time I’d finished the first chapter of The Formula. I read the entire book in one sitting – it was just too hard to stop learning about the various “laws” of success, disguised as detective stories, which both entertain and enlighten. Here are some illustrative samples: Serena Williams worked hard, won many tennis tournaments and became a celebrity (OK, well-deserved). In sports, winning games measures performance, which in turn correlates with fame (more or less). In science, the relationship is a bit trickier. As a neuroscientist, I particularly liked the story of Douglas Prasher, currently a courtesy van driver in Alabama, who had the first idea and did the lion’s share of the work on tagging genes with fluorescent proteins (knows as GFP). This revolutionary new technique allows neuroscientists and cancer researchers to see when genes turn on and off. His work set the stage for a Nobel Prize, which he did not get. Barabási explains why: Prasher left science early in his career and the memory of his leading role in the original discovery soon faded. So where does this lead us? Barabási’s disciplined definition of success is not about self-set goals and personal satisfaction (“I am proud of myself finishing this review before its deadline”), which do not easily lend themselves to quantification. In his definition, success is not about your performance but how the crowd perceives it for its own needs at a particular time and in a special context. As he puts it, “Success is not about you, it’s about us.” This explains why reward is often unexpected and why its magnitude has no limits. Barabási’s central insight reinforces an old wisdom, summarized sarcastically by a character in Freeman Dyson’s 1998 book Imagined World: “You can either get something done or get the credit for it, but not both.” The Formula richly demonstrates this ugly incongruity in many walks of life, even if here and there it promises the reader that by learning the “laws” that shape performance and success, “we can use them to our own advantage.” But should we? Barabási’s humorous and captivating style describes how things are in the Western world. Yet his underlying ideas also convey a subconscious, tacit message: if you have a hunger for reward, put your efforts into self-marketing your accomplishments, discoveries and art pieces because the personal returns may be orders of magnitude higher than using your talents for further discoveries. From the societal point of view this is a great loss. Can network science offer any useful advice about how to revert this ugly divorce between honest effort and falsely attributed success? Can we find a sweet spot where the magnitude of the reward, such as a CEO’s salary, is both rewarding and motivating? Can we look for examples in other cultures where accolades are kept at bay to sustain performance? As President Harry Truman noted plainly: “It is amazing what you can accomplish if you do not care who gets the credit.” But perhaps this will be the topic of Barabási’s next book. György Buzsáki is the Biggs Professor of Neuroscience at New York University. His main interest is neural syntax—that is, rules that allow brain networks to generate an unlimited amount of information from a limited number of neuronal patterns.